Today we're looking at the Think Tank case from COMSCOM in South Korea. If you haven't heard of them, don't worry - neither had we. 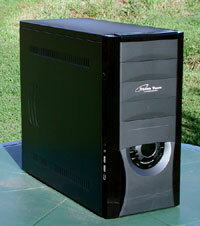 According to their website they have been producing cases, power supplies and various accessories since 2000. This particular case has some interesting features, so let's take a look at it in detail. The camera is lying a little in that first photo - the difference between the lighter grey front panel and the darker grey surround is not as pronounced normally. Still, at first glance it's an attractive if simple steel case with a plastic fascia. On the back we see a single 80mm exhaust fan mounted in a space with a circular mesh which is raised to help keep fan noise down. The fan provided is a MARTECH unit which is nice and quiet during use. 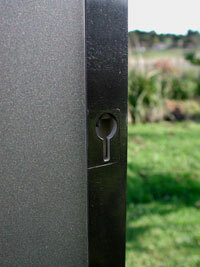 Thumbscrews secure the side panels but they are the only thumbscrews used in this case. There is a padlock tab at the back of the left case side. 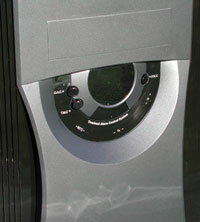 The eye is drawn to this fairly complicated-looking front panel, which COMSCOM call the "Panoramic Panel". This panel hints at some of the unusual features of this case so we'll look at it in detail later. Also on the front fascia, but on the side of it, is this collection of connectors. As usual we see USB, FireWire and Audio connectors here. The audio connector cable is unusual in that it doesn't go to the motherboard's internal audio connectors, but rather terminates in a stereo jack that you run out the back of the case then loop around and plug into your sound card. The reset button is also located in this cluster, which again is unusual, but sensible enough and nicely recessed to avoid being accidently hit. Second from the top is a connector marked "CHARGE", which is the first big surprise of this case. Believe it or not, this case provides a mobile phone charger. The phone sits in a plastic cradle which attaches to the hole shown in the second photo, not far from the top of the case on the side, and a lead goes from the CHARGE hole to the phone. Nokia and Samsung compatible leads are provided with the case. Also provided with the case are a decent-sized bag of screws, standoffs etc, three of the flat kind of thermal probe, a manual which is mostly clear but has some amusing Korean-English in it and a small device with "Hub Box" written on it. This Hub Box is a central component to the fan-control and thermal-monitoring features of this case and again, we'll look at it in detail later on in the review. 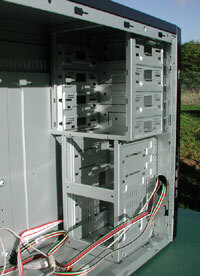 Room for drives is provided in the form of four 5.25" bays, one 3.5" exposed bay and three 3.5" hidden. This is fairly typical for a minitower. 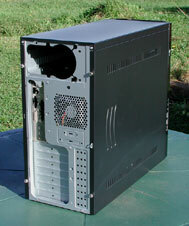 This case differs from others I've reviewed recently in that there are no drive rails used. To be honest, I don't feel strongly either way about using or not using drive rails. The build quality of this case is quite good, with virtually all edges folded so they aren't sharp. It's quite strong and provides plenty of room, but there are some touches that hint more towards the budget end of the case market than the luxury end. A simple example that may come across as petty is the case feet. On this case they are simply extruded out from the sheet metal of the case floor. It would be preferable to have plastic or rubber feet. Firstly, these would avoid scratching a desk when moving the case around, but also they provide some dampening of vibration and noise. Those horizontal bars across the back of the 3.5" drive cage make things a little fiddly also, and I find myself thinking that if the bottom one wasn't there, I could squeeze another hard drive in. At the moment that lower space seems to be dedicated to the PC speaker mount which seems a waste. 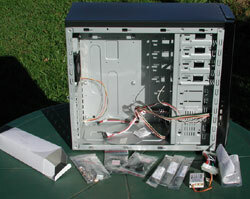 In fact, with a re-think of that lower area I'm sure four hard drives could have been accomodated. 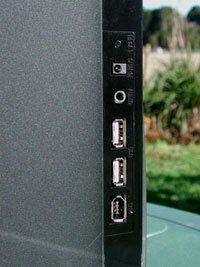 Another example is the PCI slot covers. On many cases nowadays they are held in place by thumbscrews, but the Think Tank reverts back to the old "stamped out of the back of the case" method, where you wiggle them backwards and forwards to remove them. If you discover you need to install another PCI device at some point this can be a little awkward if your motherboard has tall components like capacitors or internal audio connectors near the PCI slot covers. Again this is a minor quibble, but when you add all these little touches together you get a feel for the quality in a more expensive case.